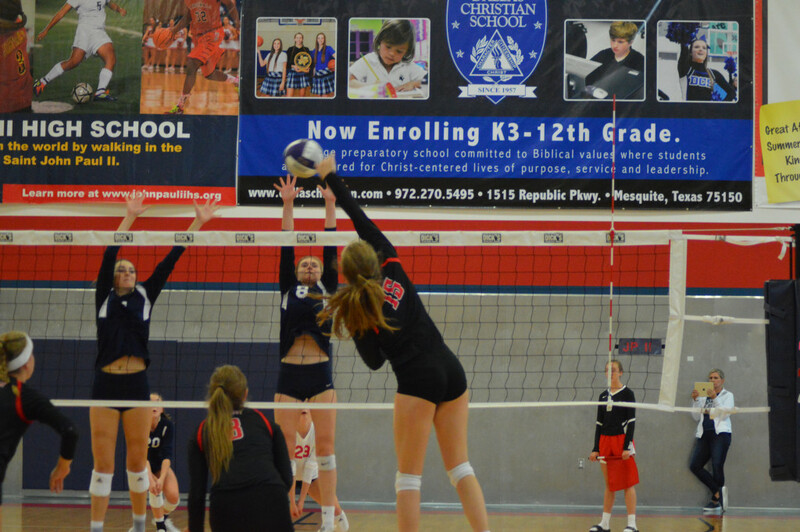 This week’s Senior Spotlight features Senior Middle Blocker, Rachel Langs. 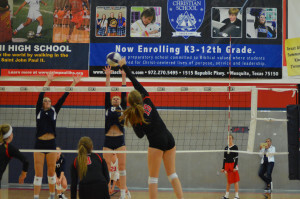 In the past 3 years on Varsity, Rachel has been a dominating force at the net. In this season, she has had a record high average hitting percentage of .472 and 141 total blocks. Langs has been an integral part of the Leopard front row and placed fear in opposing hitters with her towering size and effective blocking. 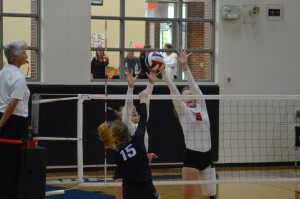 She says her favorite memory of LOJO Volleyball was playing with her big sister, Sarah who now plays volleyball for the TCU Horned Frogs and will compete against Rachel in the Big 12 Conference. Rachel will continue her education at Kansas University looking to major in education with an emphasis on elementary and special education. The Jayhawk volleyball team is currently ranked number 11 in NCAA Volleyball programs. Head Coach Ray Bechard said, “Rachel is just a wonderful kid who has a great spirit about her. Her enthusiasm is contagious and she is hungry to learn. 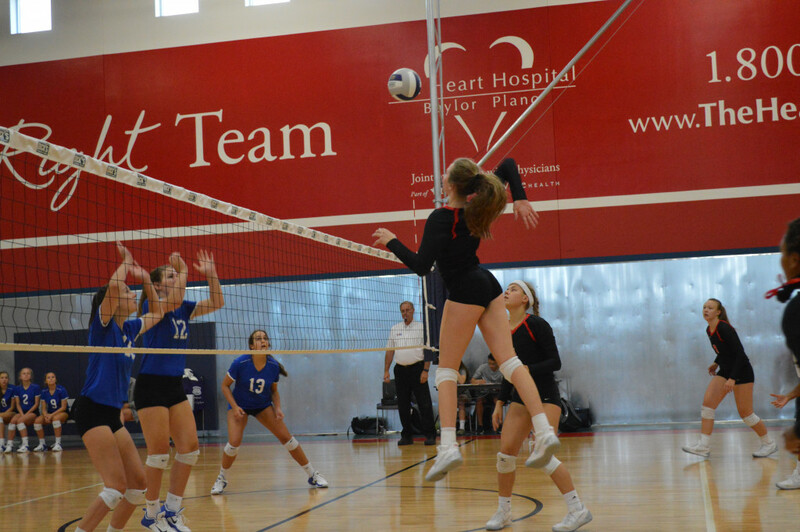 On the court, she is a prototype Big 12 middle blocker, in that she has a good physical presence. 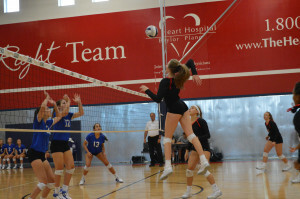 She is already productive as a two-foot attacker and has shown signs of being extremely dynamic off one foot.” (KUathletics.com) Not only is Rachel excited to continue her competitive volleyball career, but she is also looking forward to supporting her fellow Jayhawk athletes in other college sports, like the number 4 basketball team in the nation. 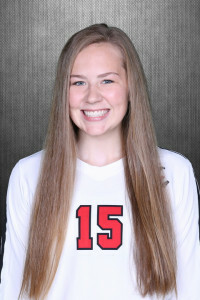 An all around athlete and positive teammate, Rachel has been nominated for several awards such as the 2017-2018 Under Armour All-American Team, lea der in blocks for the Dallas area, and was recognized as a “Senior Ace” from Prepvolleyball.com. For District 15-5A, Rachel was also voted most outstanding blocker. 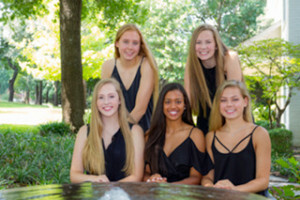 Langs also had a successful club season this past year, winning the USA Volleyball 17 Open Championships with TAV 17 Black, under the coaching of former Olympian Ping Cao. She notes that “working hard and setting goals for yourself” is what she has learned in volleyball and wants to pass on to other players in the future. Congratulations on such a successful high school volleyball career, Rachel! We are so excited to watch you achieve your goals at the next level and we are so proud of you!